How Often should you Bathe your Dog with Flea Shampoo? If your dog is scratching themselves more than usual, or maybe you have noticed red bite marks on your own skin, your dog may have fleas! The first line of defense against a flea problem is to give your dog a bath with a flea shampoo made for dogs. Flea shampoos are made with special medicated ingredients such as pyrenthins that kill fleas and their eggs on contact. This provides your pets with immediate relief. Please remember to only use your dogs flea shampoo on your dog: ingredients such as pyrenthins which kill fleas are toxic to your cat. Buy a product specifically made for killing fleas on cats to help your feline friends. So, how often should you bathe your pet in flea shampoo? How do you Check your Dog for Fleas? How Often Should you Bathe your Dog in Flea Shampoo? 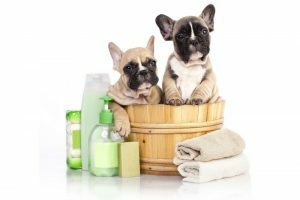 Is Flea Shampoo Safe for Dogs? Can Flea Shampoo for Dogs be Used on Cats? Adams Plus Flea and Tick Shampoo with PRECOR is one of the best dog flea and tick shampoos on the market. concentrated and formulated from all natural ingredients such as oatmeal extract, coconut oil, aloe vera extract and lanolin. These ingredients act as both cleansing and moisturizing agents, thereby leaving your dog’s fur clean, shiny and smooth after application of the product. Adams not only kills fleas, it also deep cleans your dog, removing dirt and dander. The additive PRECOR Insect Growth Regulator kills the adult fleas thereby hindering the life cycle of the same for the next 28 days. Also, is best to use the shampoo only within 18 months after the date of packaging. 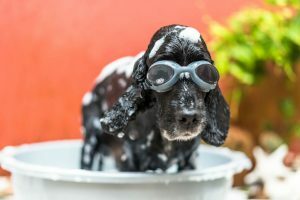 How often should you bath a dog with fleas? As soon as you notice your dog has fleas. 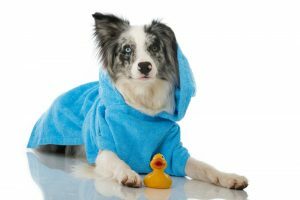 You can give your dog another flea bath right away if the infestation is bad, otherwise, Adams recommend every 7-14 days. As always, do a spot check on your dog to make sure that they are not allergic to the ingredients in this shampoo. Adams has a large selection of flea shampoos and products that are safe to use on dogs. They are priced better than a lot of the competition, and the best price is online. This top selling Seresto flea and tick collar comes recommended by Vets. It provides a low concentrated continuous release for 8 months of protection. If you don’t like the idea of medications or topical flea treatments this one may be for you. I have used Capstar before and wow, it kills all of the adult fleas on your pets within 4 hours (6 hours for cats). The constant itching and scratching stopped almost immediately. It is a pill that you give your pets that kills adult fleas. It is safe to use on puppies and kittens 4 weeks and older. If in doubt, always consult your vet before giving your pet new medications. I have used both Advantage/Advantix and Revolution for my flea issues. I found that the fleas were not being killed by Advantage any more so I switched to Revolution. Depending on where you live, you may need to get a prescription from your vet. Revolution is a safe and simple monthly topical medication used to protect your dog or cat from heartworms, fleas, and ear mites. Revolution is also used on dogs for the treatment or prevention of fleas, the American Dog Tick, ear mites, and canine sarcoptic mange. It should only be used on dogs older than 6 weeks. Never use use your dogs topical flea treatments on your cat: they contain ingredients that will seriously harm your cat. Only use products that are made specifically for your cat. I personally have found a ton of success using a spray called VetKem. I would consider it the best flea spray for your home on the market. My 2 pets were infested and the fleas were jumping all over me when I sat on the furniture! GROSS! I sprayed VetKem in the furniture and the carpets as well. Don’t forget to take off the cushions and pillows and get right inside the dark cracks where fleas love to hide and wait for their next victim. I also sprayed in the cracks by the floorboards. One can does go a long way, so the cost is worth it. It kills all fleas, eggs and larva for up to 7-8 months. Of course, you can’t stop there. You will need to use human power. Good old fashioned elbow grease! You will have to vacuum your carpets (or sweep your floor) and furniture DAILY. Spray some vet kem and put some salt in your vacuum bag or canister to kill those fleas that get sucked up. Maybe I went a little crazy. But all the effort paid off and within a week or so all of the fleas were DEAD. Fleas are experts at hiding on our pets bodies, in our home and our yards. You really have to search to find them. They are attracted to warmth, light, movement and the carbon dioxide in our breath! The best places to start searching is in the moist areas of your pets body which include their hind ends by their tail, on their neck, face, and by the ears and eyes. You might not find a live flea, but you may find what looks like dirt on their skin. If you take that dirt and rub it on a paper towel or piece of paper, it will leave a red streak. This “dirt” is actually flea poop! So gross! It is made up of your pets blood! This confirms that your pet has fleas. You will need to begin treating your pet before it becomes a huge problem in your home. Giving your dog a flea bath is similar to bathing your dog in regular dog shampoo, except flea killing shampoo for dogs needs to be left on for 5-10 minutes to ensure that the fleas and their eggs that are living on your dog have been killed. Each flea shampoo manufacturer has different instructions so please read the bottle and follow the instructions to get the best results. First step is to make sure to follow the instructions on the bottle. Leave the shampoo on for 5-10 minutes (make sure to have treats or a helper handy!). Comb or brush your pet with a flea comb and get all those dead fleas and eggs out of your dogs coat. Some how often can you use flea shampoo on your dog? Bathing a dog with fleas should be done once you notice that your dog has a flea problems to give them immediate relief from itching and scratching. If your pet has a big flea problem, you can give them another bath right away, otherwise every 7-14 days is recommended by most manufacturers. 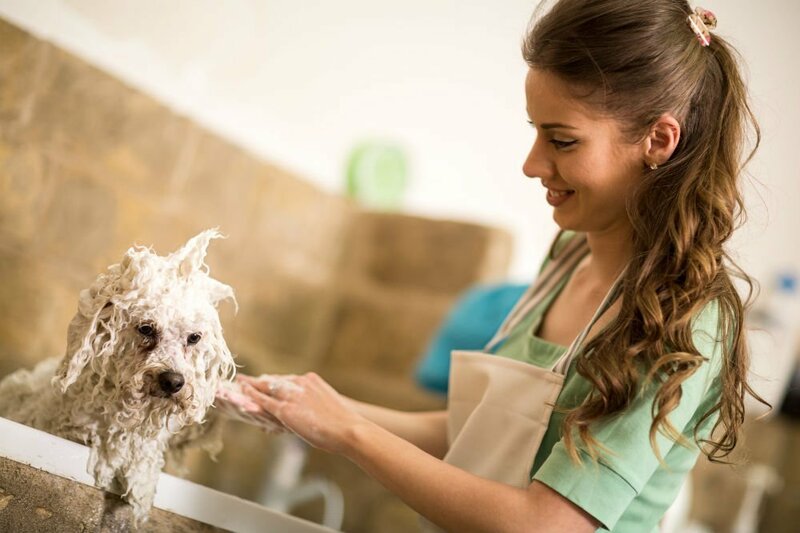 You do not want to bathe your pet everyday, this will dry out their skin and fur and your dog may end up having skin AND flea problems. Make sure to wait 24 hours after applying a topical flea treatment before you dip your dog in a flea bath. Flea killing shampoo for dogs along with flea collars, flea combs, furniture sprays, and topical treatments will rid your home of fleas and prevent fleas from returning. Most manufacturers of flea shampoos for dogs also have a line of total flea control products such as Adams, which makes everything from flea shampoo for pets, to flea collars, to flea sprays for furniture and your yard. Attacking your flea problem from all angles, makes sure to get it under control fast. Most of your flea problem is because of fleas that are NOT on your pet. Rather, they are fleas that are living and growing in your home! You may be wondering, once you have tackled the fleas on your pet what else can you do to eliminate and prevent fleas from returning? Washing your bedding, pillows, cushion covers etc. means that you will drown those fleas and wash away their eggs and larva. 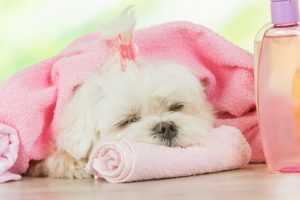 Fleas cannot survive high heat conditions such as those found in your dryer. Drying your items in the dryer ensures that you’ve killed the flea eggs, larva and adults. 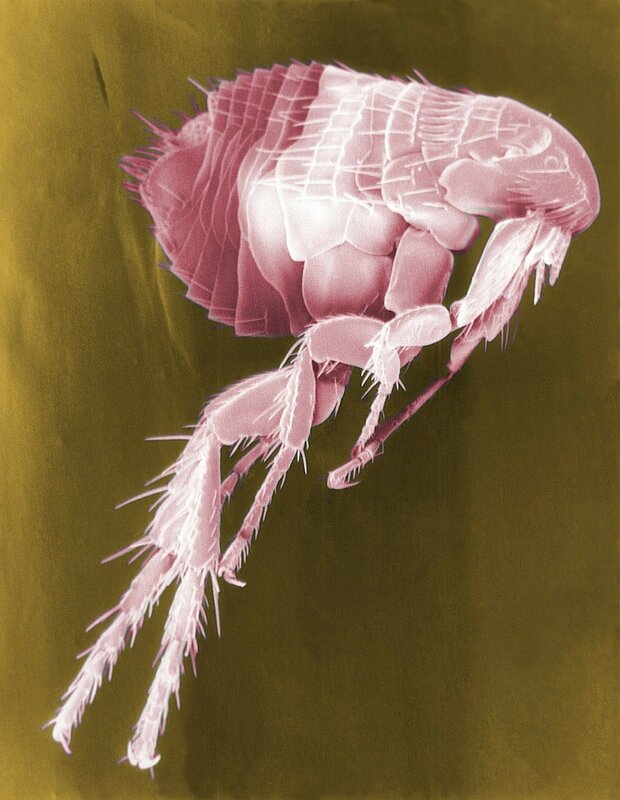 Kill those hiding fleas dead by spraying flea killing spray on your furniture and in the cracks next to your floorboards. Vacuum them up into a canister filled with salt or Vetkem. Be vigilant. You can purchase a fog kit to bomb your home if the problem is terrible or if you have tried everything possible. Please note that some fogs can be harmful to pets and children and maybe even adults. You’ll have to leave your home for a time, so please read the manufacturers directions and plan accordingly before using these types of products. If all else fails, you may have to call in the professionals to deal with the flea problems in your house. Once they have worked their magic, make sure to have a supply of flea killing products at home so that fleas do not infest your home again. You may be wondering if can bring fleas home on your clothes or shoes and the answer is yes! Petting other animals, as much as we love them, can bring fleas into your home. Also, fleas love to hide in plants and grass and wait to hitch a ride on you or your pet. They end up inside your home and multiply like crazy. Fortunately, there are several yard treatments you can do, some chemical, some natural, to reduce the flea population in your yard. This #1 best selling yard spray kills not only fleas on contact but their eggs, ticks and mosquitoes. Excellent! You only use this product outdoors by connecting it to your hose and spraying the area. This product is plant based and safe for your household. Made in the USA. View more products from Vet’s Best HERE. It comes in a variety of sizes, starting at 1lb. So, how does soil kills fleas? Crazy right? Well, turns out that this specific type of soil has tiny bugs of its own called diatoms. They have the ability to slice up fleas (who have an exoskeleton) and cause them to die of dehydration. I imagine these tiny little insects battling the fleas..haha. Kill those fleas DEAD! 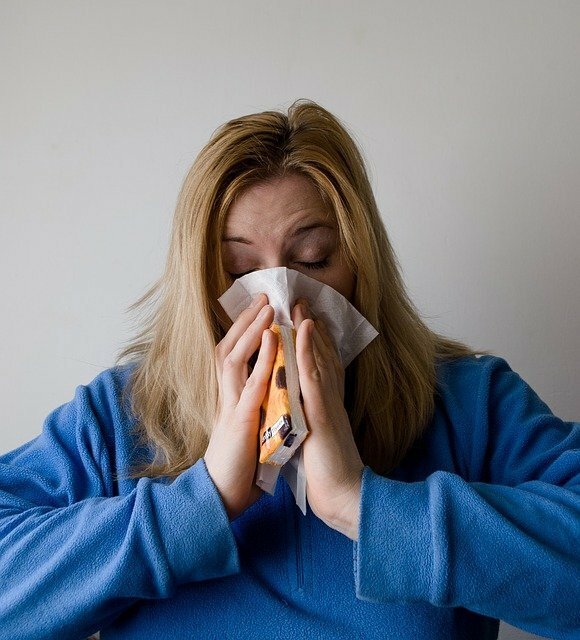 If you live in an area where fleas are common, such as temperate climate or humid climate (usually its both) early detection of fleas is super important. Catching the problem early on can mean the difference between a few fleas and hundreds. Topical treatments are so effective. Once a month and you don’t have to think about it. My personal favorite is revolution. My personal experience is that advantage/tix no longer worked on the fleas in my house for some reason and I had to switch brands. If you buy 6 or 12 month packages you can save $$$. Flea collars and flea killing shampoos can repel fleas for a certain amount of time but would work best if used with another type of flea killing treatment. Adding garlic or brewer’s yeast to your dogs food is a way to help in naturally repelling fleas. A flea infestation in your dog’s fur is a serious condition that should be given special attention. These parasitic creatures persistently feed on the blood of your pet and the resulting bites leave them irritated and itchy. Your dog, like mine, could even be allergic to the bites and scratch themselves raw! The skin infections caused by flea bites may also result in anemia which is a serious condition. It’s a great idea to research the best flea and tick shampoos for dogs before deciding which one to use on your puppy or dog. Fleas lay up to 50 eggs per day! Flea eggs and larva must be exterminated, not just adult fleas or the flea life cycle will continue. Flea shampoo is safe for dogs. Companies that manufacture flea shampoos for dogs know their stuff. They formulate their dog shampoos with ingredients that are deadly to fleas yet gentle on your dog. They do this by hiring Vets and pest experts to ensure you get the best quality product possible. Flea shampoo for dogs from dollar general or family dollar is a no go. Do NOT skimp out and be cheap with your pets health. Spending an extra 5$ could mean the difference between a healthy happy cat or a $1,000 vet bill and health problems for life. Just.don’t.do.it. The flea shampoo that you use may not be safe for your puppy. Make sure to use an alternative flea treatment and purchase a flea shampoo specially formulated to be gentle on your puppy such as Wahls Products. No. Unless the product states on the bottle that it can be used on cats and dogs, then do not use it on your cat. You will have to buy a product that is specially formulated for cats. Ingredients such pyrethrins that are found in flea killing shampoo for dogs can seriously harm or even kill your cat. If you do not use a flea shampoo specifically made for cats, or flea products made for cats in general, they can make your cat very sick. 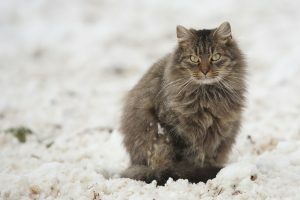 This can cause your cat to experience nerve damage and even death. You might also wonder if you can use a flea shampoo for cats on your dog? The answer is the same: unless the product specifically says it is for BOTH cats and dogs, do not use it on your pooch. It could seriously harm or even kill your dog. Even then, we recommend reading the ingredients list to ensure that nothing in the flea shampoo could harm your cat or dog. 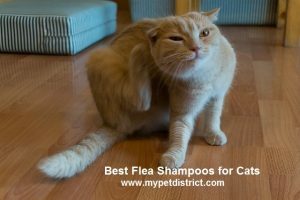 We review the Top 4 Proven Best flea shampoos for cats in our post here. This is another no no. Trying to save a few bucks on your pets shampoo can cost them their health. 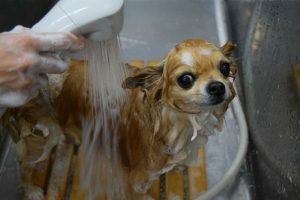 Save yourself the pain and sadness, and a few $1,000 in vet bills, and buy a reputable shampoo such as the ones above. Puppies, especially those under 12 weeks of age, are particularly vulnerable (because they are so little) to the flea killing ingredients in flea control products. Try the alternatives above if you find fleas on your puppy and consult your vet if you can’t get rid of them yourself. If you do not want to use flea shampoo on your dog (maybe it is too young or pregnant or otherwise sick) there are alternative flea treatments you can use. Alternatives to flea shampoo for dogs include using Dawn dish detergent, diatomaceous earth in your yard, throwing down Borax or salt onto your carpets/floors and vacuuming/sweeping regularly, flea collars, topical flea treatments and furniture sprays. In this instance, I would recommend using other methods of removing fleas from your dog instead of a shampoo that contains flea killing ingredients. Try a flea comb, dawn dish detergent and treat the furniture/bedding with flea sprays. Remember that most of your flea problem comes from the fleas, eggs and larva in your home, not the ones on your pet. Reducing or eliminating the fleas in your home and on your pregnant dog will reduce the chances that the puppies will end up with fleas. Consult your vet for further information. Do you have a trick or tip to get rid of fleas? Need more info about the best flea control shampoos for dogs? Check it out below! Cat Grooming 101: Do I need to Groom my Cat?